· When mixing, agitate or stir gently for 3 minutes after adding the LandSpring WP. DO NOT EXCEED 3 MINUTES OF AGITATION. Do not use agitator during spraying. · Initiate spray application as soon as possible after mixing and no later than 15 minutes after preparation of tank mixture. · Spray Volume - apply LandSpring WP in a sufficient amount of water to ensure good drenching of the seedlings. Product efficacy requires that the foliage receive uniform spray coverage. · For best results, apply under slow drying conditions, e.g. early in the morning or at night, in order to ensure adequate absorption. · Do not apply if rain or overhead irrigation is expected within 1 hour of application. New Technology for Reducing Transplant Shock by Dr. Gordon Johnson - A new tool is available for reducing transplant shock. 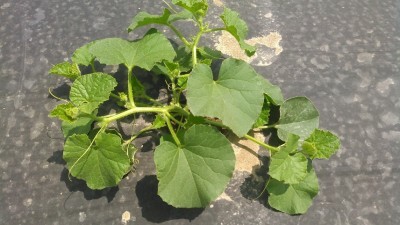 The chemical 1-methylcyclopropene (1-MCP) which is marketed as the product LandSpring by the AgroFresh company reduces ethylene production and stress on young plants. Ethylene in the plant hormone released when plants are injured or are under stress, as is common during transplanting. Excess ethylene can cause leaf drop and wilting and can increase transplant losses. The way 1-MCP works is that it has a similar molecular structure to ethylene but without the negative effects on the plant. It binds to ethylene receptors in the plant and thus blocks ethylene from causing damage. This article is from the May 3, 2018 edition of ENYCHP Vegetable News. To read the full newsletter,CLICK HERE.